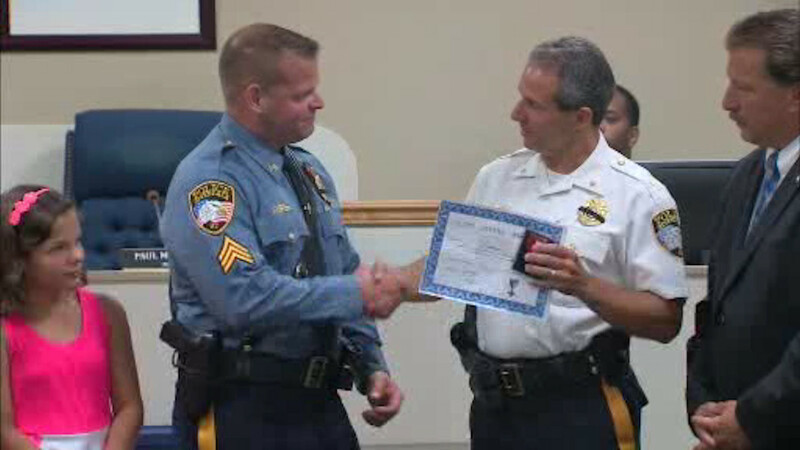 RIVERDALE, New Jersey (WABC) -- A New Jersey cop who was hailed a hero for saving the life of a suicidal man earlier this year was honored for the brave act on Wednesday night. During a ceremony in the Riverdale City Council Chamber, Police Sargent Greg Bogert was presented with the Life Saving Award from Chief of Police Kevin Smith and Mayor Paul Carelli. Last April, Sgt. Bogert responded to a call of a man walking in and out of traffic on Route 287 North near exit 53. The man was visibly upset, and while the Sargent was attempting to calm him down, dash cam video shows the man making a run for a nearby bridge and trying to jump off of it. Sgt. Bogert was thankfully able to save the man by reaching and grabbing him just in time. "For Greg to be able to do that is just something special because when you look at the video, it's his reaction time that makes all the difference in the world," Chief Smith said. "It was the right situation at the right time, and hopefully the young man involved can turn this into a second chance and that's what Greg wants too." "We're not used to thank yous, so this to me is a whole new experience after this incident," Sgt. Bogert said. "I've always said that what's important to me is this young man and I want him to know that there are people who care."